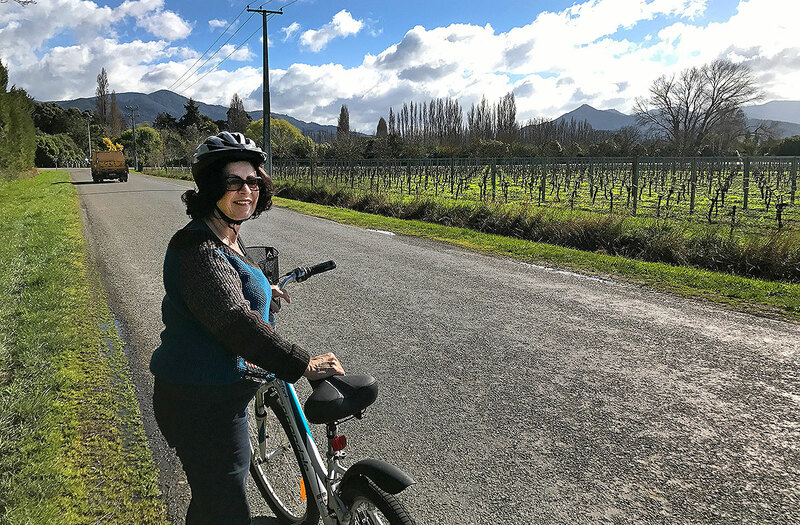 While we were on the ferry, I’d checked out a couple of places to stay on the apps and found a place called Spring Creek. 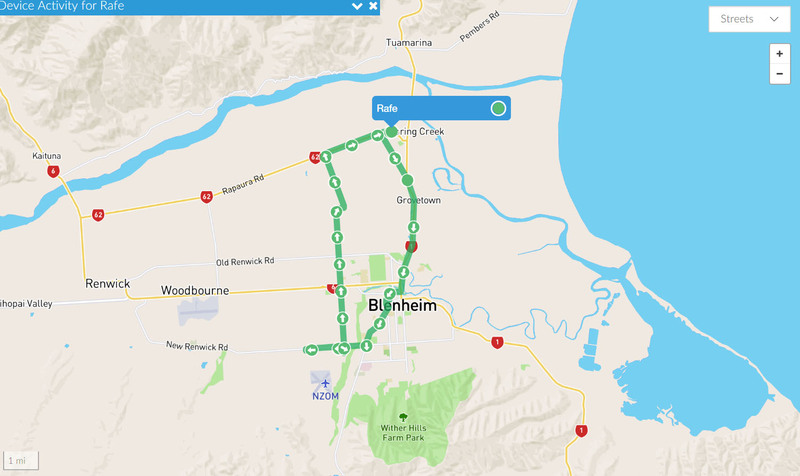 Driving towards Blenheim, its one of the first small towns you come across as you come out of the Picton hills. The weather forecast was evil with all sorts of nasties due with cold, thunder and all sorts so we were keen to get plugged in with some heat which meant a Motorcamp or a CAP. Spring Creek Motorcamp is now run by Christine and Andy who last november moved down and are doing it up. It was very run down and with their experience from running the Top 10 at Orere Point by Clevedon, they making really good strides forward. The camp is huge and is lucky that it has huge mature trees all around it and with the stream running along one side of it is a great place to stay. 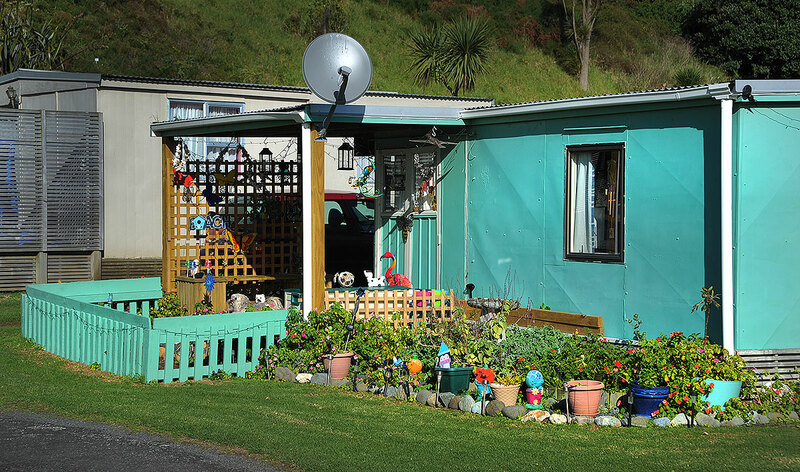 They also have quite a few motel units here and a backpackers building. Fiona and I were staying a week so arranged for a weekly off season rate but the normal nightly powered site for 2 cost is $35 which is really reasonable. The showers are superb and are $1 and there is a well equipped laundry and dump station plus they’re really nice people as well. We spent the first two nights on a gravel park as the grass was a bit soft and the forecast was evil. 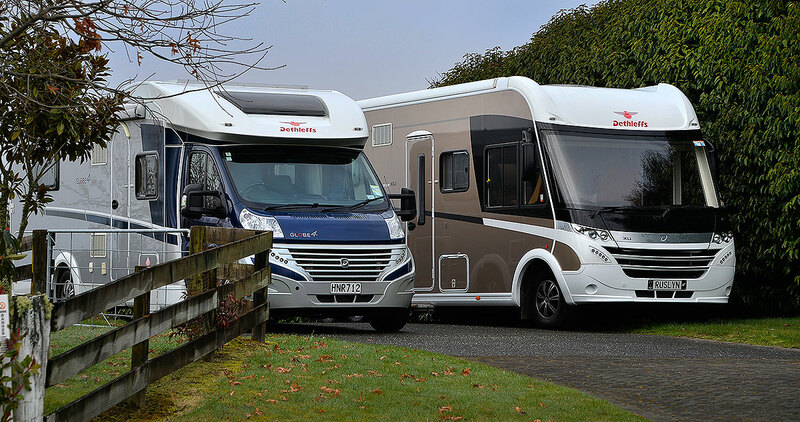 We’ve been here before when we bought our wee Rafe caravan down several years ago. The chocolates are amazing and we couldn’t leave without buying some. Right across the road from here is Saint Clair Family Wines with a full wine tasting facility and restaurant. We met a nice young couple and their young son from Australia there who were doing the vineyards in their small rented Jucy van. She was a Kiwi who had come back to see her family in Hamilton. Most people tend to go for the Sav Blancs and sweeter wines but I’m a die hard Chardonnay person and she was too, so we were both tasting the same wines and comparing notes which was fun. After an hour or so there, we jumped on the bikes and rode back with the wind to Spring Creek Camp just beating a shower 🙂 .. its a lot more fun screaming along with the wind! Primo spot next to the creek. 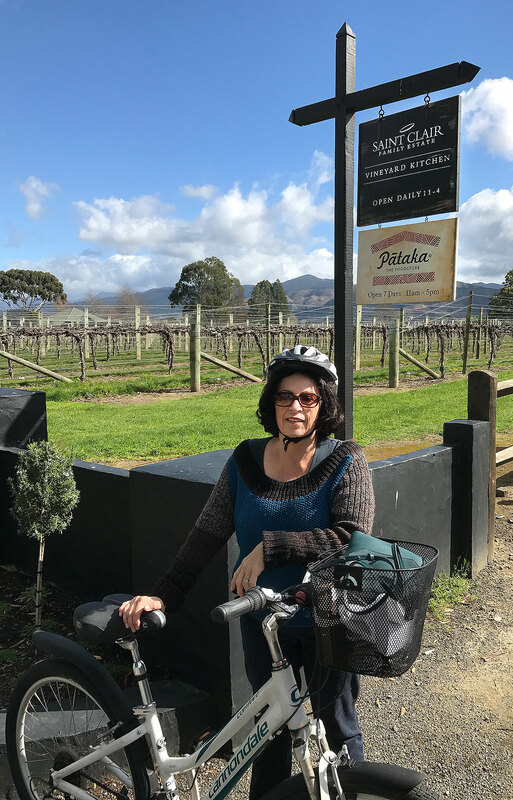 The next day, we took Rafe to the local supermarket in Blenheim and later went to Wither Hills for lunch which was just amazing. More wine tasting and the most amazing Beef lunch which melted in your mouth, washed down with some really nice Chardonnay. It doesn’t get much better than this. Fiona had a really nice Lamb Pie and really enjoyed that. 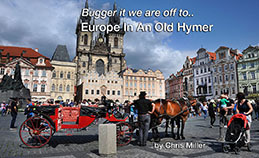 Nice people, nice Restaurant, superb food and easy Motorhome parking too. When we returned to the Camp, Andy, the camp owner, suggested that the park by the stream on the grass might be solid enough to park on so with some sheets of ply to stick our driving wheels on just in case, we parked right by the stream. There is a pet Eel called Eddie and his friends who are fed every morning and come right up on the bank. A neat place to be and we’re having fun. 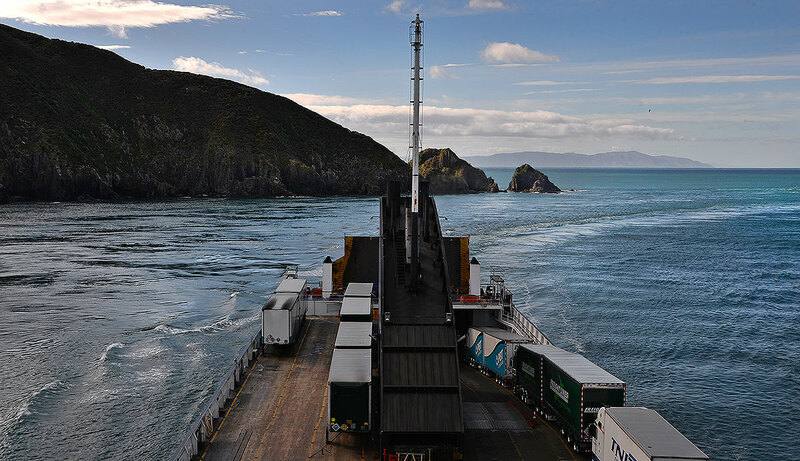 For our last night in Wellington before the ferry, we thought it would be sensible to get a bit closer to avoid the weekday traffic with our early check in being 7am at the Bluebridge terminal. The NZMCA App screamed out the Petone Club as a good place to be and we cruised in the late morning to this massive park. 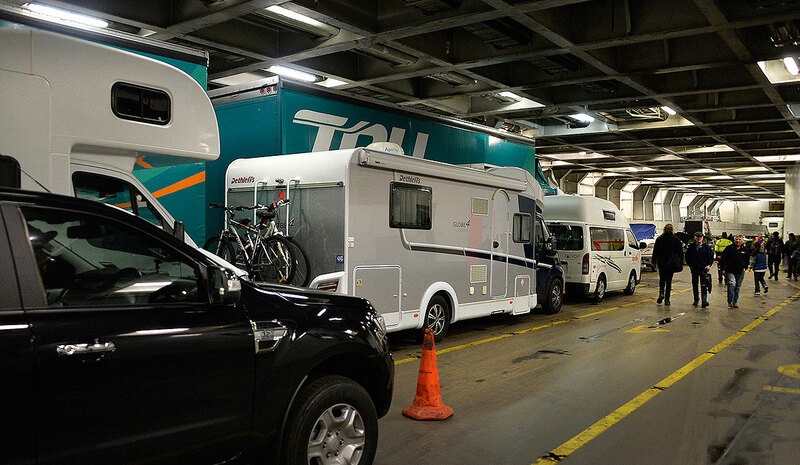 There’s plenty of room to park and they’re very obliging and helpful. They have a Buffet going for lunch and dinner and you’re very welcome in the bar. Just remember to take your NZMCA card with you. The parking area is huge and all sealed. The power is a bit awkward as it is all in a bunch of 4 plugs right next to the entrance to the Motorhome parking area so its throw your leads over the fence. The entrance to the parking area. The power is on the gatepost outside. Our lead was just long enough to reach but it all works and for $10 a night, a fantastic place to stop. There are also toilets and a shower that can be used too. We went for walk down to the local Pak N Save for some basics, which is about 20 minutes walk away. Later in the day, we invited our next door neighbours over for a drink. John and Margaret hail from Masterton and were staying in Wellington. After a pleasant hour with them, we went into the Petone club for a spectacular tea for $9.50 each and a Sticky Date pudding.. Yum! All washed down with a huge $7 glass of chardy.. also Yum! A nice spot. Onto the ferry next. Some new China at the new park. Some of our china plates that we bought a few years ago in Oamaru that we use in Rafe, had deteriorated. Fiona had managed to find some new ones the same sort and colour on Trade Me so on the way south, we had to pick these up in Porirua. 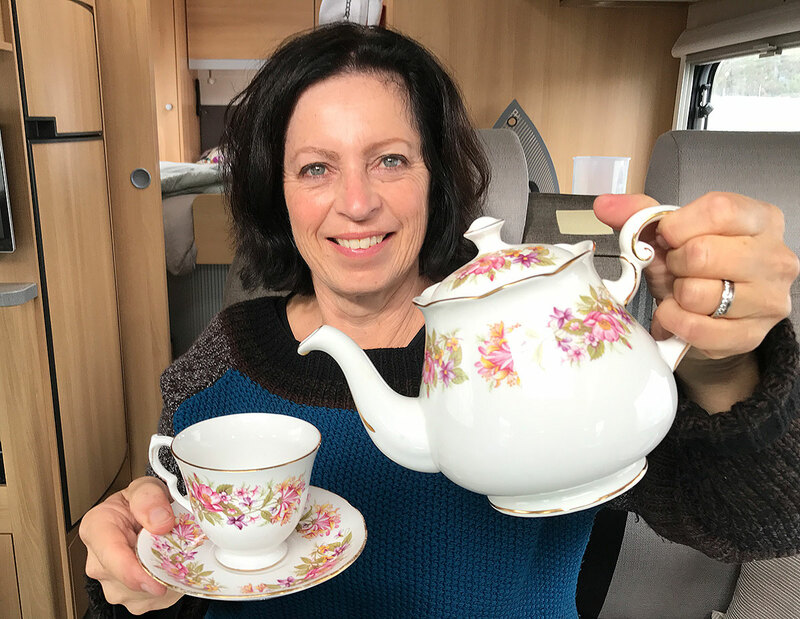 This time she got a Teapot, 6 of each, cups and saucers, small side plates, bigger side plates, bowls and dinner plates all for $190 !! ..
A panorama of the park when we arrived. 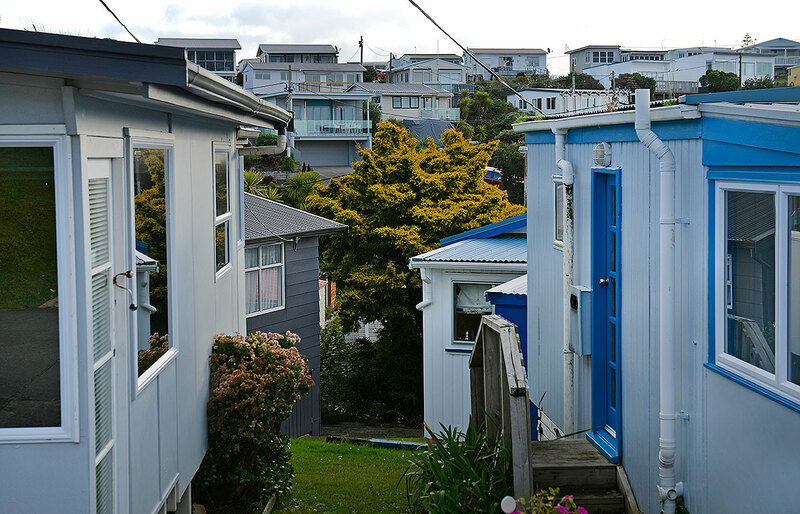 After getting the China, we headed straight for the new Plimmerton NZMCA park and it looks fantastic. There had been a working bee on ealier and it was pretty busy. 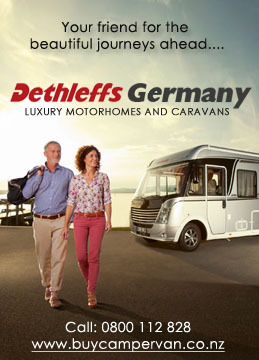 I counted over 40 Buses and Motorhomes there. The new Dump Station looks great in the middle and its really handy to the Railway Station. A great spot. We called our son Alex who is currently working in Wellington amnd he popped out for tea. 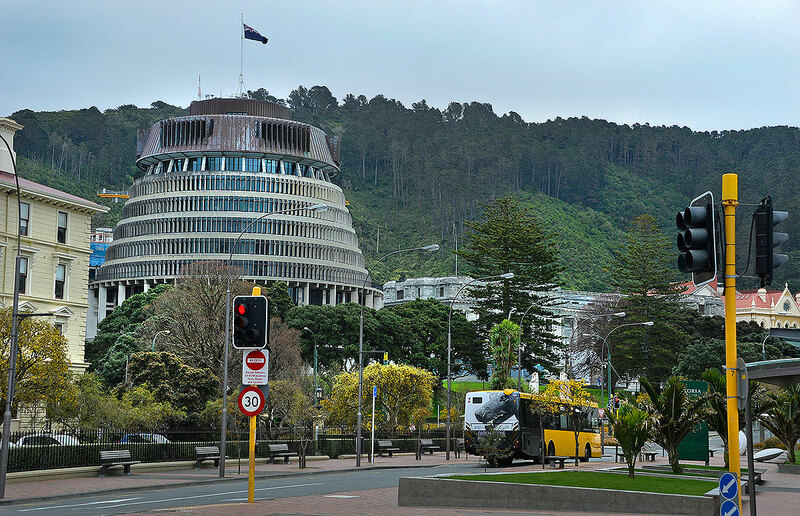 The next morning, we got up early and caught the train into Wellington City. Its an easy walk from the park and only takes 25 minutes and then we walked around to a French cafe for brunch. 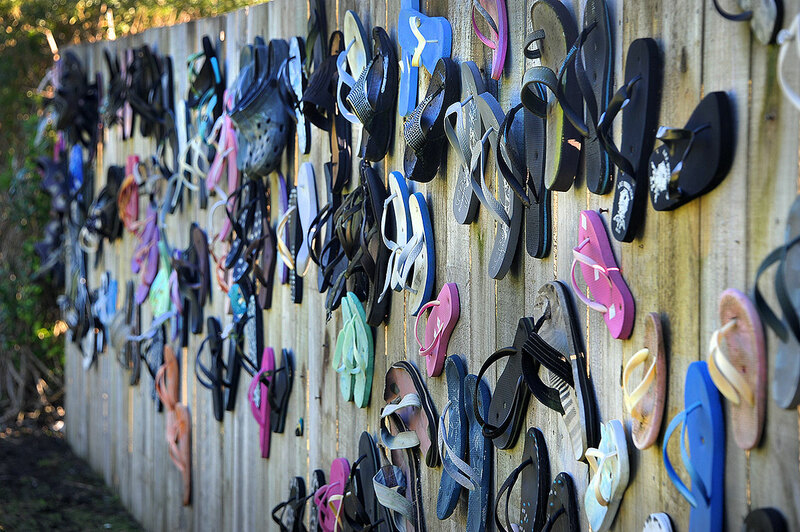 You know you’re in Wellington when you see this. Alex later dropped us off at Rafe in Plimmerton and stopped for a cup of coffee and then headed home. I’m impressed with this park and have to say, the crew here have done a great job with it. 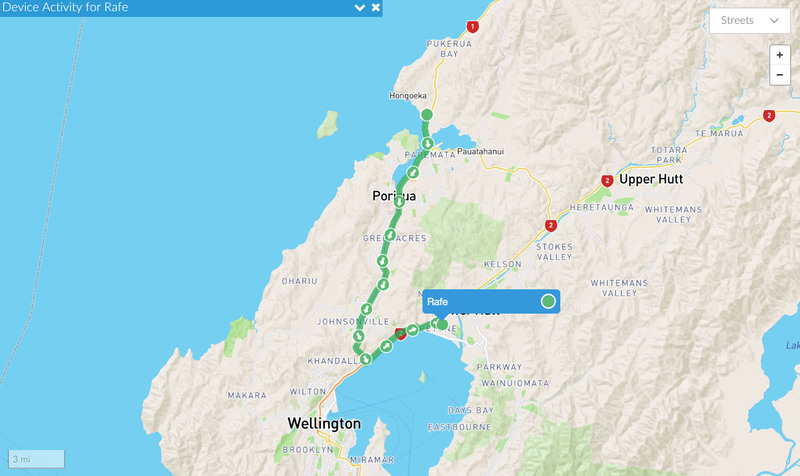 Fiona was keen to stay a third night but as I’d booked an early ferry during the week, I thought we might be better closer in for our last night with the early morning weekday traffic. A nice park and I’m sure it is going to be well used and enjoyed by many. 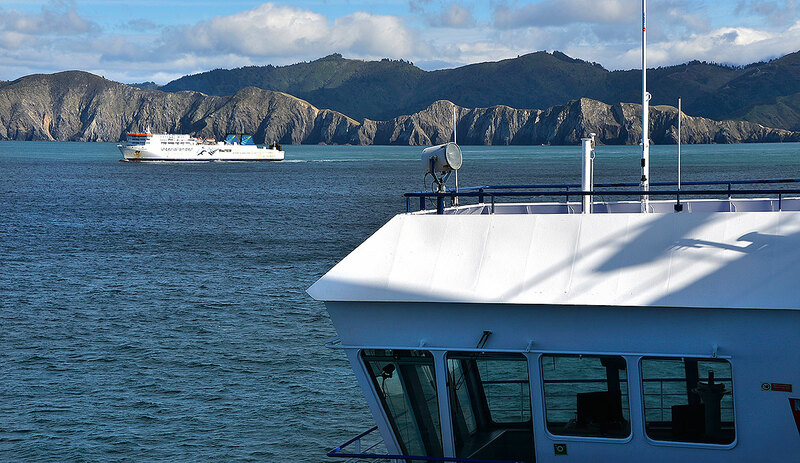 South Island, here we come. 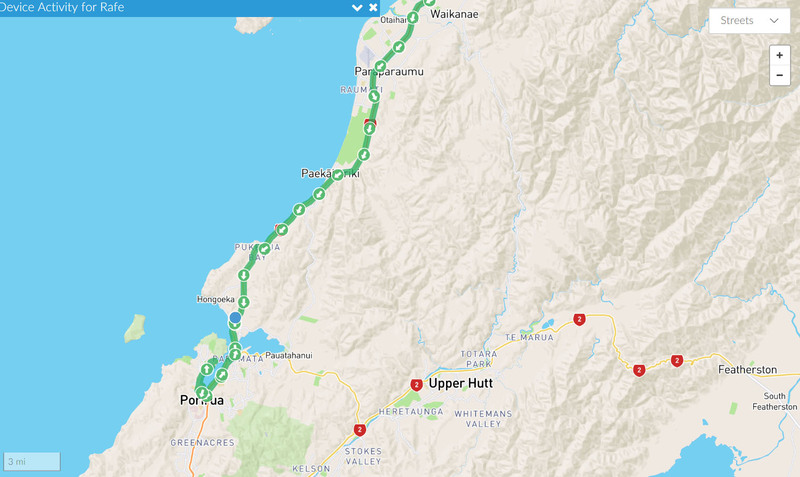 After spending our last night in Auckland with eldest son Drew and his partner Jenna in Milford, we set off in the morning, bound for Taupo. 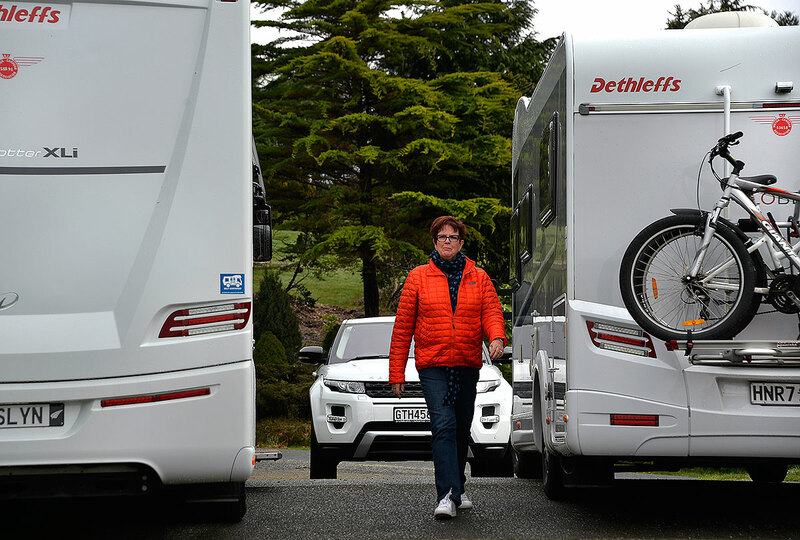 We were heading for Dianne and Gary’s home in Taupo to meet other fulltimimg Motorhome friends Ian and Lynda, who arrived earlier in their Dethleffs XLI. Dianne and Fiona made a spectacular curry for us all and we had a lot of laughs and lots of fun. 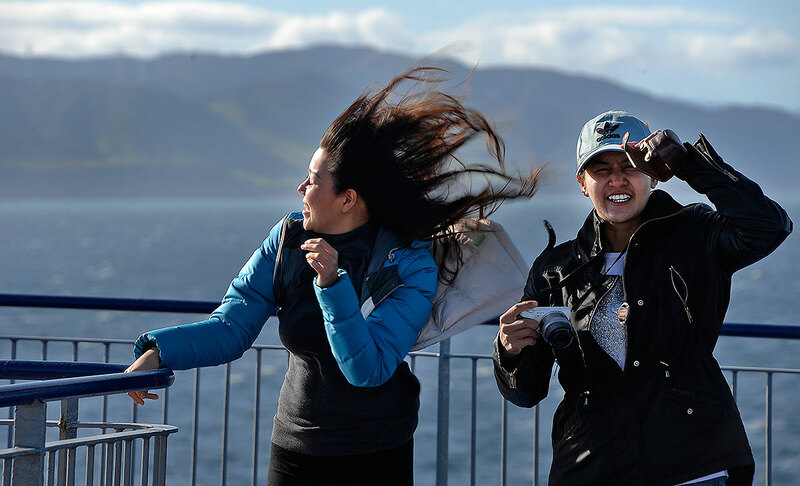 In the morning, we all went to a local Cafe and then for a look around Taupo. Another great night with everyone and lots more laughs and Fiona and I were off to Rafe for the night. In the morning we caught up briefly with everyone for a cup of tea and then we were off, heading further south. We stopped at the Army Museum in Waiouru for lunch which was great and then carried on to Mangaweka. 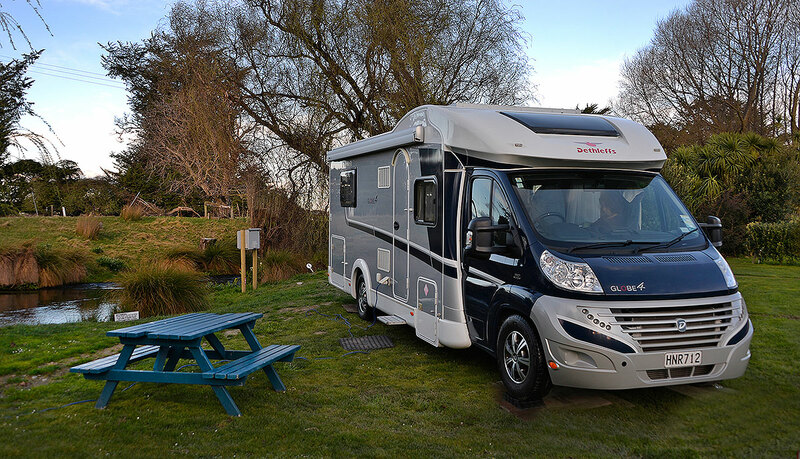 We stayed at a neat wee Campground in Mangaweka last Christmas with Gary and Dianne and its a fantastic place right by the river. The same people own another more upmarket Campground with a bar and eating area right over the bridge. 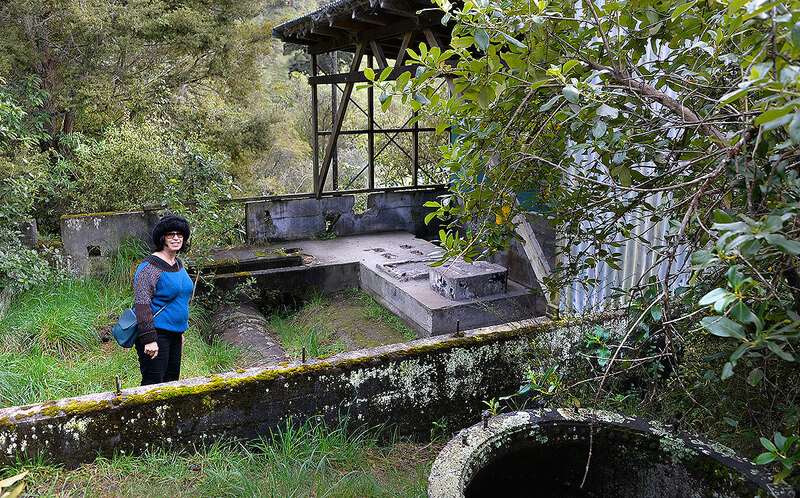 There is also an old Power Station just along the road with an old dam. Apparently Mangaweka was one of the first to have its own streetlights and electricity in the country, all driven by this local dam. 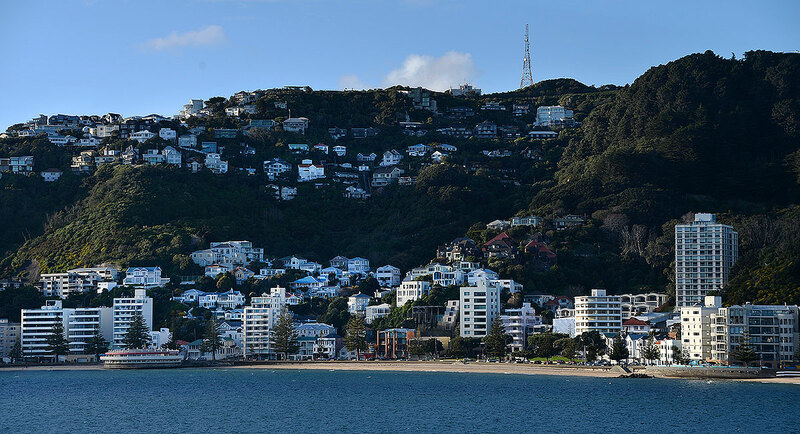 At $7 a night each with power with our NZMCA discount, it is spectacularly “reasonably priced” but I understand the price with soon be $9 per night with no discount. .. Still very good value in a lovely spot. 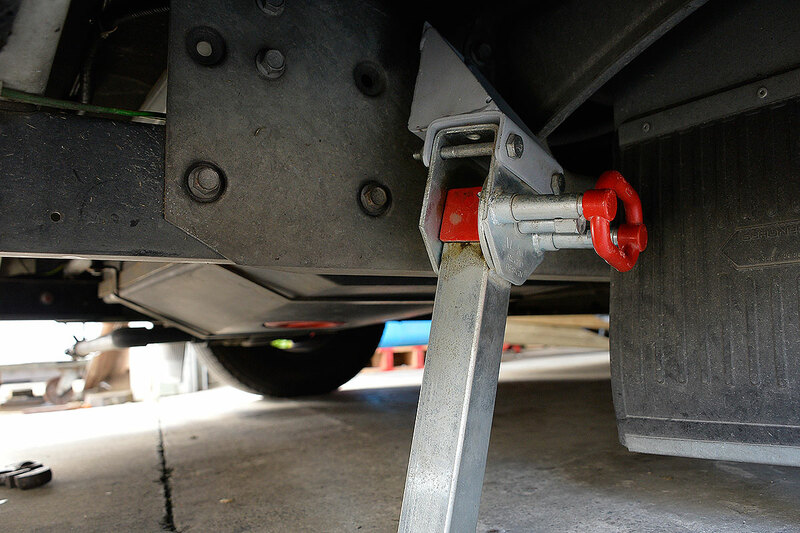 One of the discoveries we made in Europe was the huge impact on life in a Motorhome when you have drop down steadies. 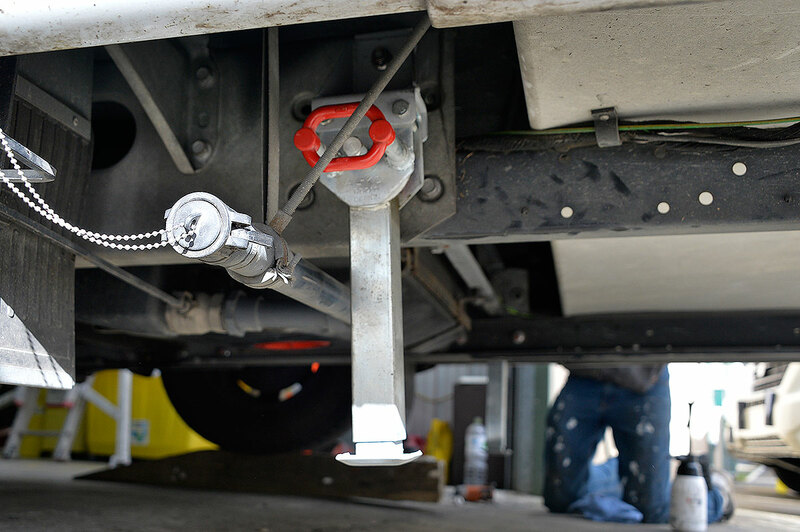 Our Uk rental, Ralph had quite squishy air suspension and had a couple of steadies on it but being a rental, the steadies had been damaged. The thread had been stripped on one side but we were able to get enough out of it to make a difference. From this, I made a decision that we would get some added to Rafe when we got home to NZ. 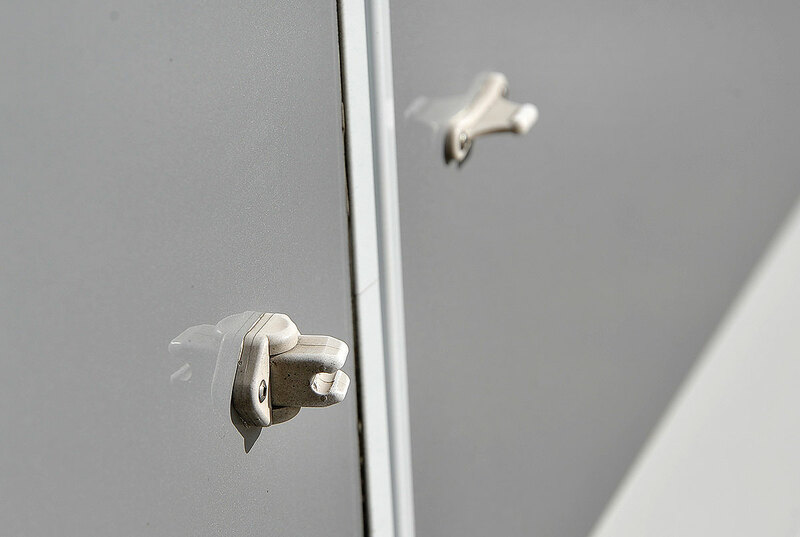 While we were looking through the huge Motorhome accessory store, Berger in Berlin, I found bigger catches for roughly 2 Euros a pair and got 3 pair for the habitation door and the garage doors at the back of Rafe. The day came when we could get the Drop Downs installed and while we were there, get the catches changed. 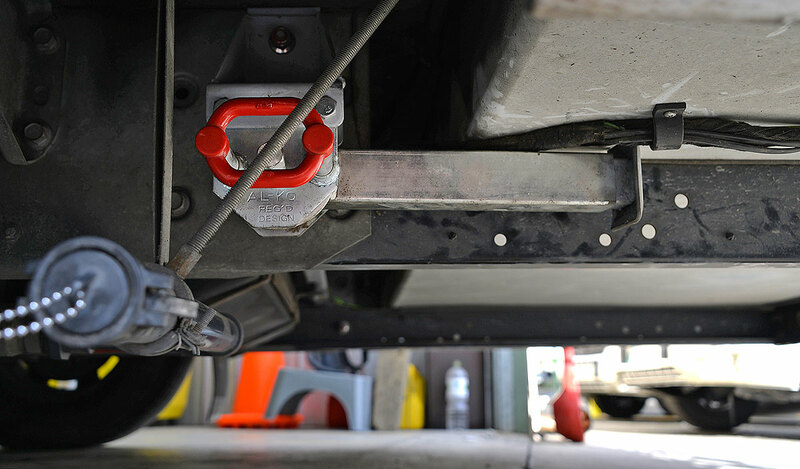 Vantage RV had some Alko Drop downs which had brackets made for another Dethleffs customer who had changed their mind and so were left with them in their store cupboard. 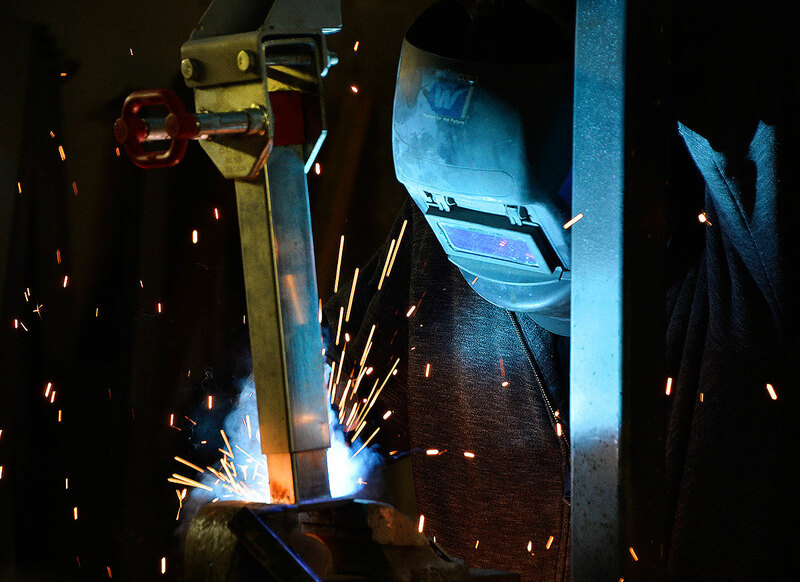 The ones they had were set up for an A class vehicle which is higher that Rafe so they had to be shortened and have the feet re welded on. They look fantastic, they work well and although Rafes suspension is a lot stiffer than Ralphs being a lot younger, they work brilliantly. The catches make a huge difference too and it was all done in a couple of hours. Brilliant!! 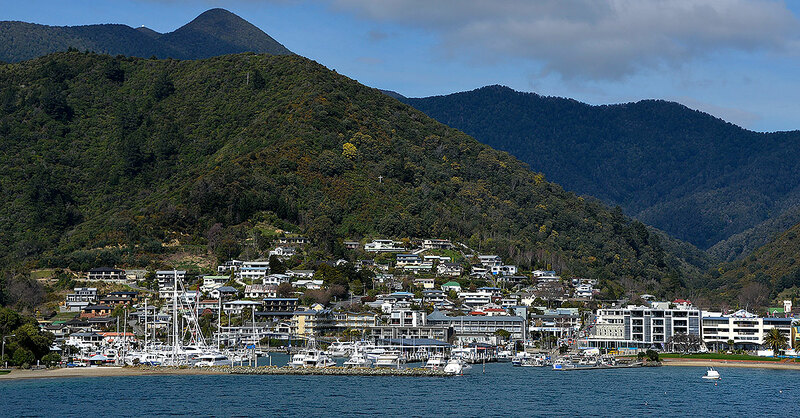 Without wanting to annoy our old neighbours, we spent a couple of nights down by the Marina in front of my son Andrew’s house while we sorted out some Winter clothing for the South Island. 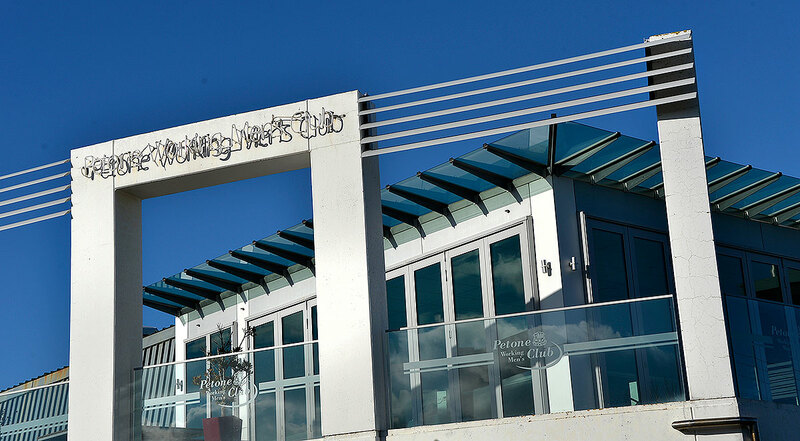 It was nice to catch up with some of our old friends around the marina and such a nice place to stay. 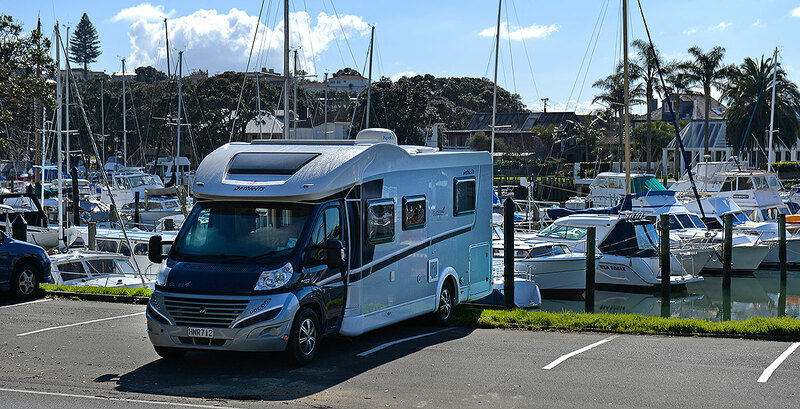 There were still two nights to go before we were catching up with our Devonport friends before our South Island trip so we thought we’d treat ourselves to Takapuna Motor Camp and check it out since we’d voted for it to stay. 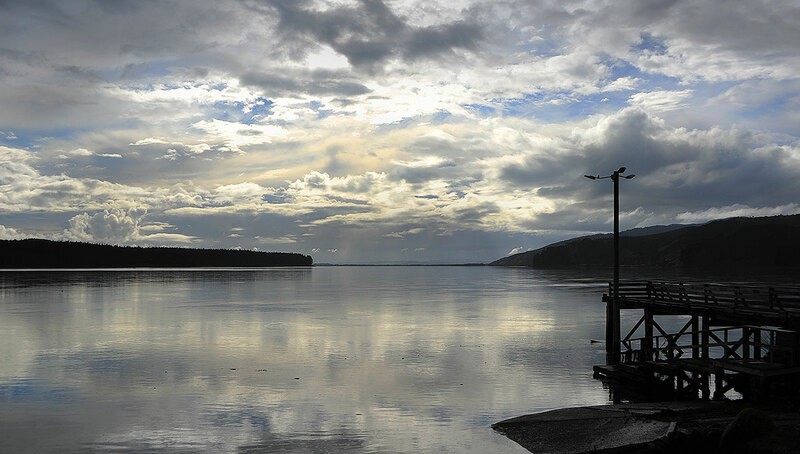 The Tide is in and what a view. 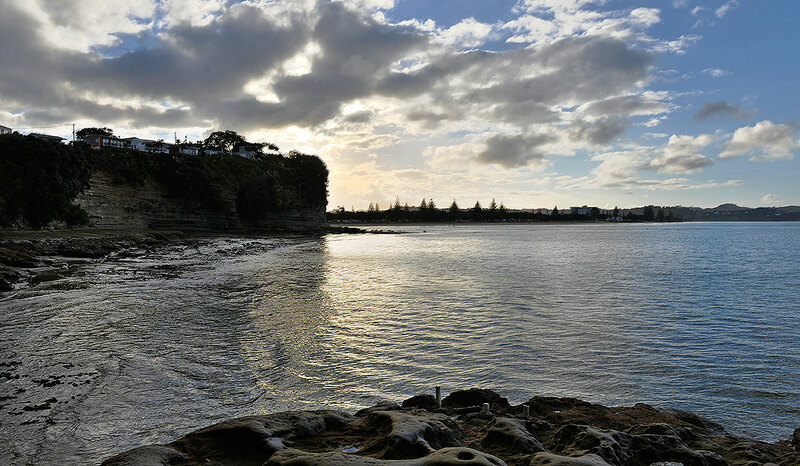 At $47 a night for two on a waterfront site, it seemed to be to be on the pricey side but once you see the site on a good day, it is just magnificent and on our second morning, I received a text from good friend Alan asking if he could “come for a coffee at our Waterfront Mansion”. Close to the water parking. The Camping ground is great. It is only small so I could imagine it would be easily and often booked out on school holidays and Christmas Holidays. 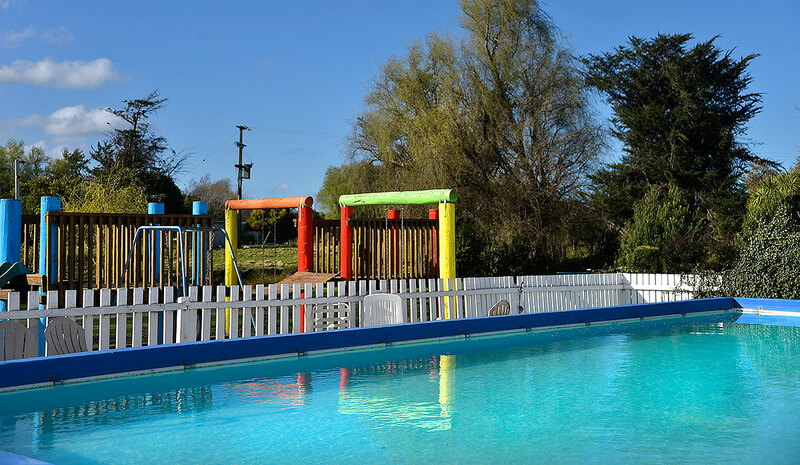 Standard Sites are $42 and they also have chalets and caravans you can stay in. Loos and showers are free and are fantastic. The shower I had was one of the best ever with real pressure. 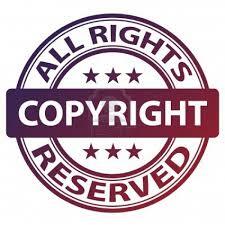 Click on these images for a Slideshow. On a quiet Sunday afternoon, we would watch people have fun with their boats on a low tide here. Lots of fun and games. The walkway right in front. 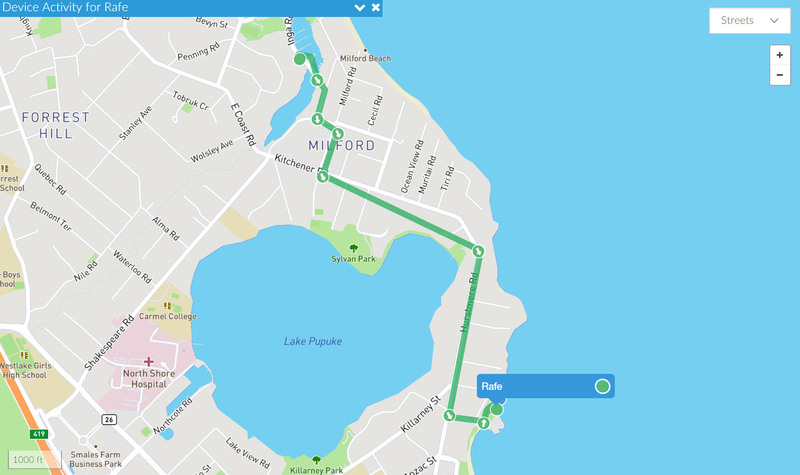 We went for a walk one night into the Takapuna main street, Hurstmere Rd, for an ice cream, an easy 15 minute walk. I grew up about a block away and went to primary school about three blocks away so I’ve been keen to see what its like but living locally, I’ve never had a need to stay here but I can say its absolutely a primo spot. 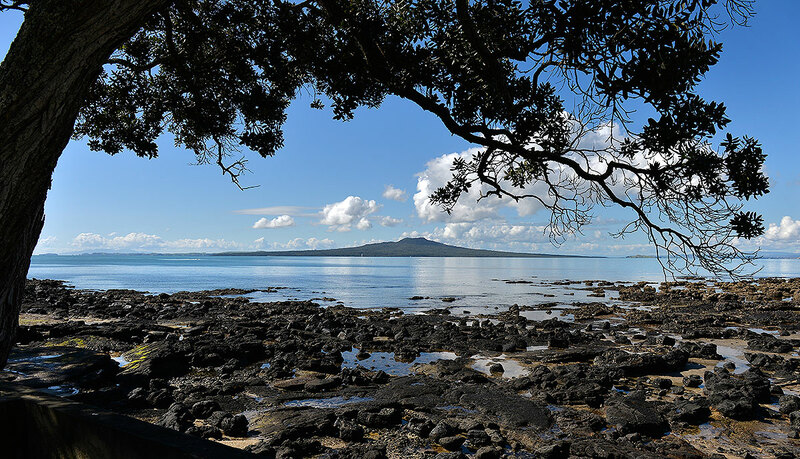 It is handy to everything and being right on the water with a view of Rangitoto like this, it doesn’t get much better. There is also a really nice Café right next door and the coastal walk goes all the way around to Milford from right in front of the Campground. 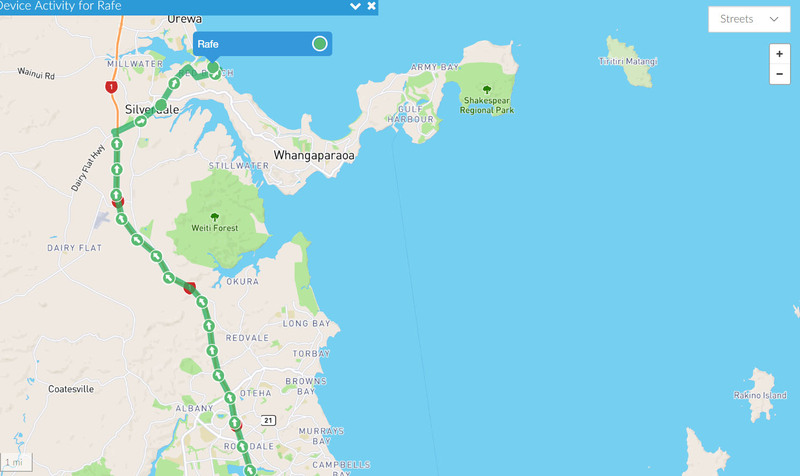 Rafe’s track from the marina to Takapuna. 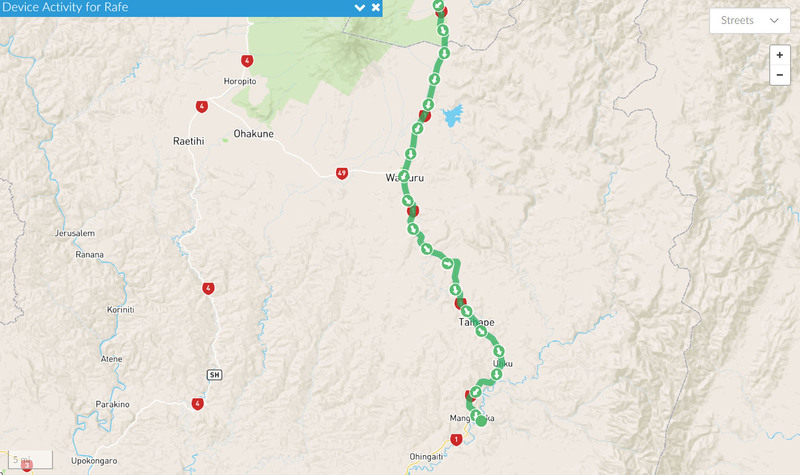 We spent a nice couple of nights with the two Grandsons and their parents at Ardmore and then we headed off to Port Waikato for our last night away for the weekend. 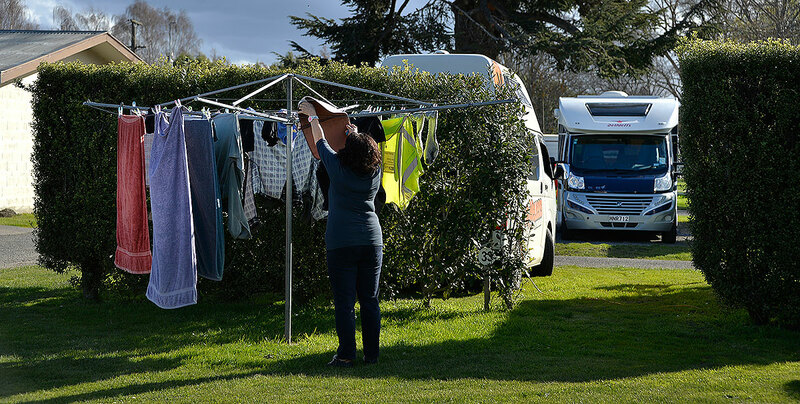 The last time I came to Port Waikato in the middle of last year, the camp was run by a very helpful French chap who couldn’t do enough for you. Last year in October, the camp was bought out by a Hapu of Tainui and the welcome we got from manager Mathew was unbelievable. After finding a nice spot for Rafe and settling down, Fiona and I decided to walk the 1k or so down to Sunset beach. A nice easy flat walk and the beach is amazing. 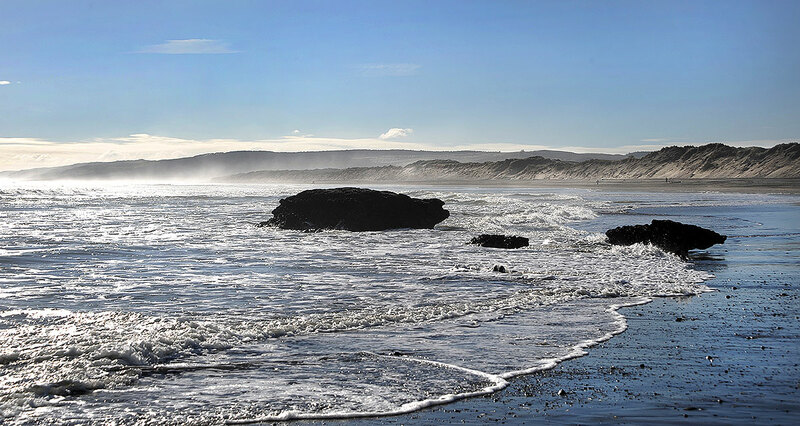 There is something that is quite magical about our West Coast beaches. We spent an hour so taking it all in and then headed back to Rafe. 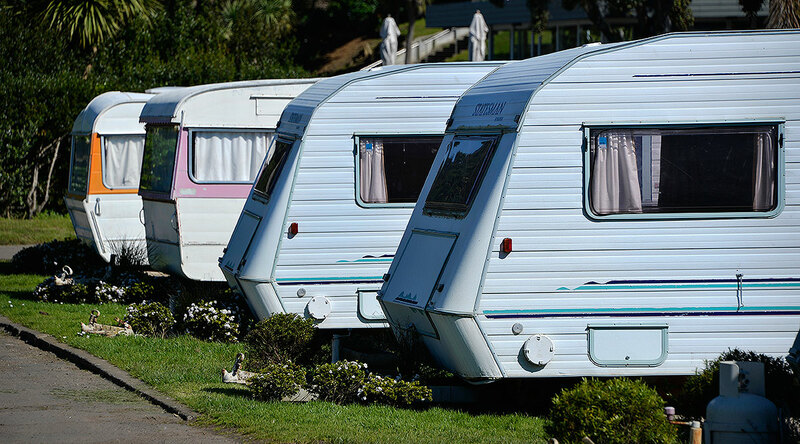 As it was a holiday park and despite the cold weather, the park was reasonably busy with plenty of caravans and lots of Bach owners in their permanent chalets in the park. Some have gone to some trouble to set them apart from the others. The rain came down overnight which we expected and we enjoyed a leisurely run home with very little traffic. Its a great spot, the camp is well setup and with Mathew on the handlebars now, you’ll really enjoy your stay. Check it out. 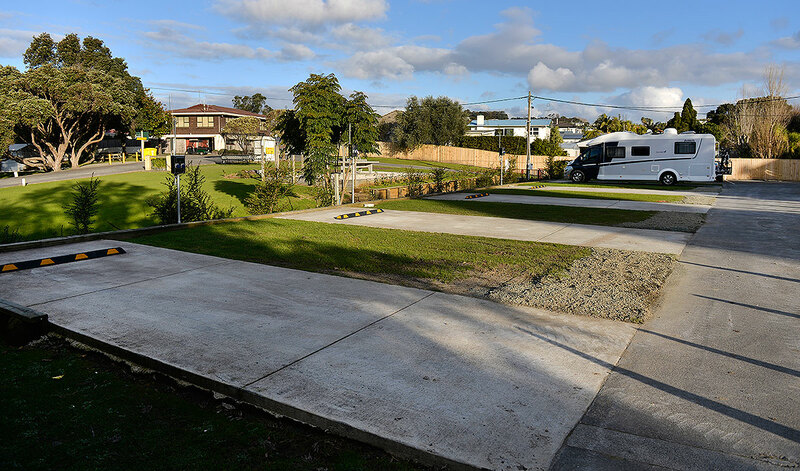 We popped in at Waipu on the way home from further north to find that the Caledonian park has now got a Gravel driveway from St Mary St which is fantastic news. 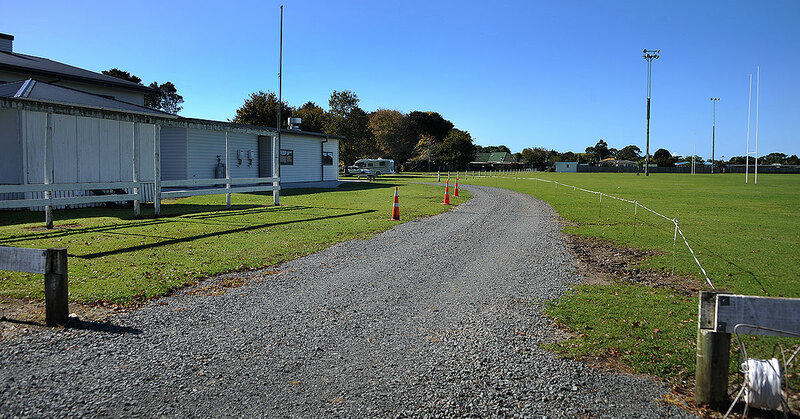 Often we’ve been there to stay and its either been wet or about to rain and although the parking under the trees is pretty well drained and solid, the road across the end of the footy field to get to the parking, is often a bog and impassable. From the carpark. You can see the parking under the trees on the right. Staying out in the carpark when there is a rugby event on is not really my cup of tea and although we’ve done this when it has been wet, its not really a relaxing area to be in with cars coming and going. So good news. 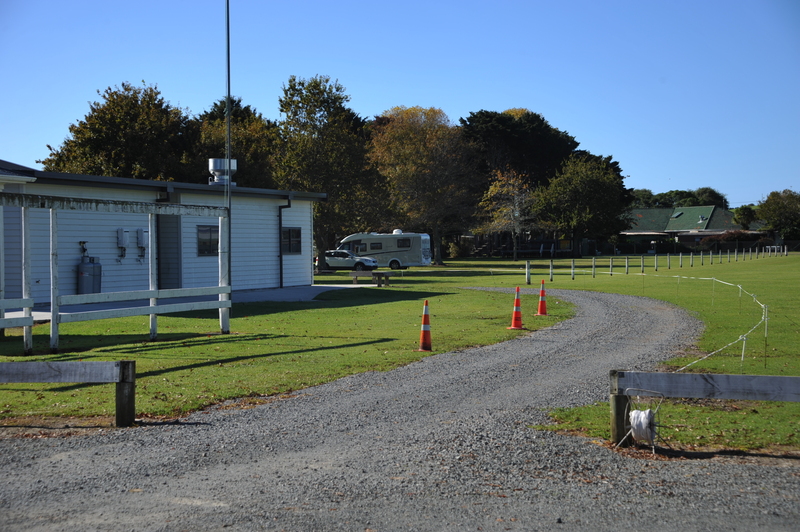 A great park for NZMCA’rs at $10 a night with power and toilets and so close to Waipu, its a wonderful place to stay. 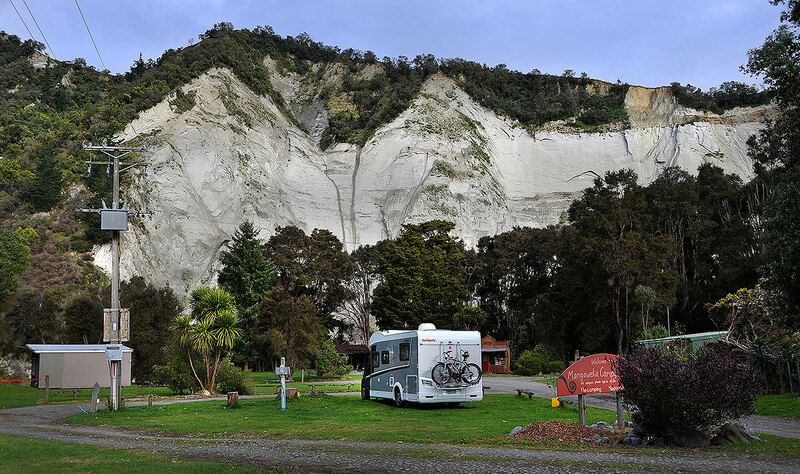 This amazing campground started out as a picnic area in the early 1900’s. About 1949, all 34 acres of it was developed into a campground and run by the Rodney Council. 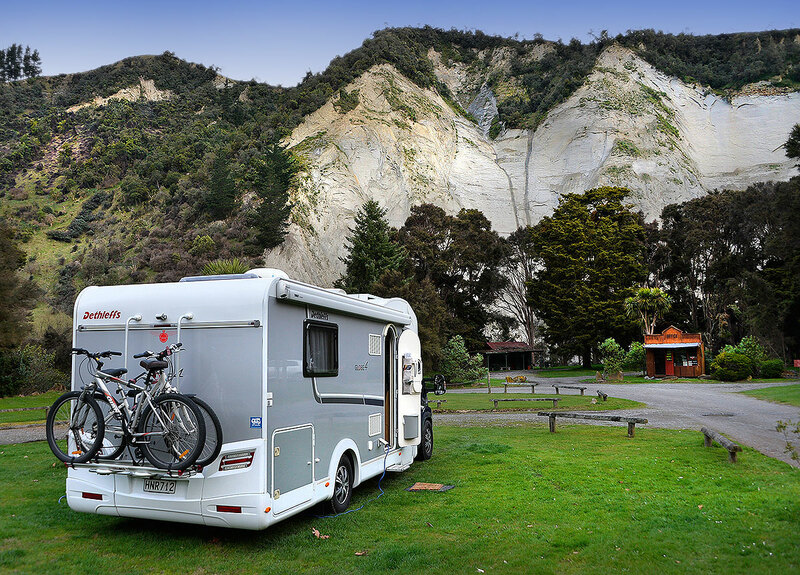 As time went on the council decided it wanted to divest of its interest in the Campground. 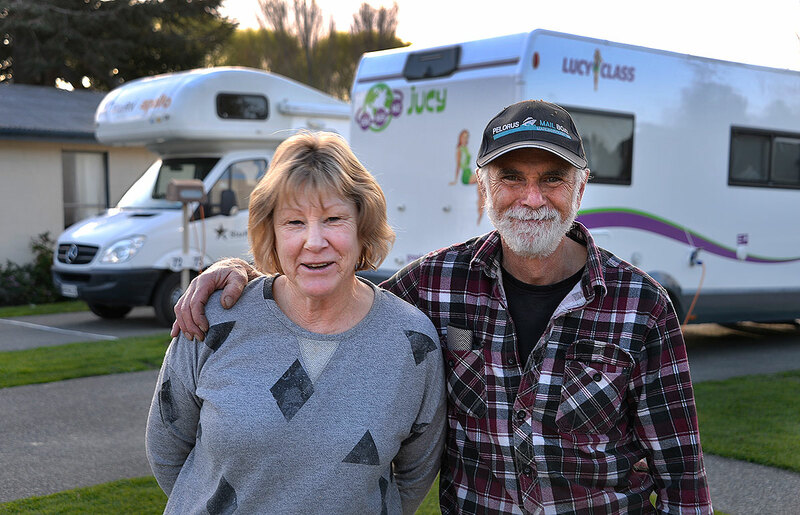 The local bach owners got together and wisely formed a company with the bach owners as shareholders and the Pinewoods campground is run as part of this. 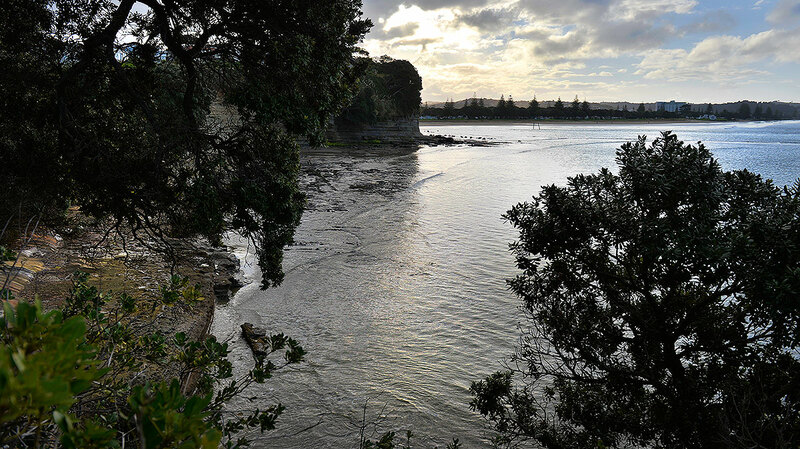 Looking towards Orewa. Baches on top of the cliff. 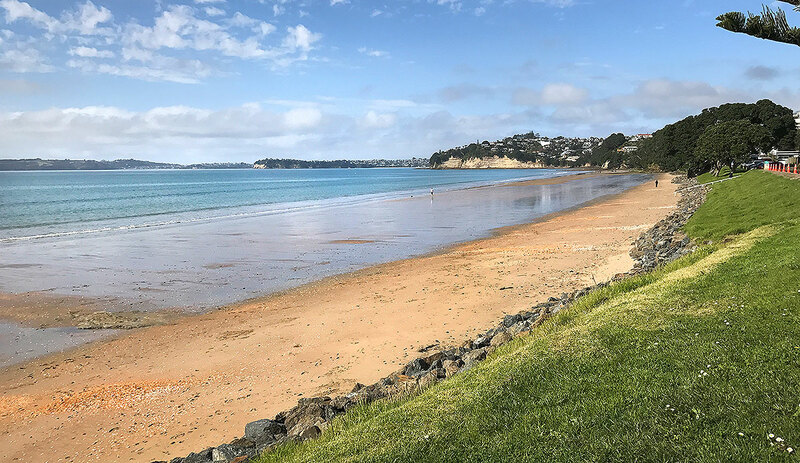 Orewa in the distance. There is a green with a stage and a big screen for movies and entertainment for kids in the summer. Plenty of neat play equipment and lots of lawn to run around on. Many of the current bach owners have been coming to Pinewoods all their lives with parents or even grandparents, and lots of children looks forward to the Christmas holidays when there is films, fishing contests, talent shows, beauty pageants, a sports day, and even tennis and golf tournaments (for the not so young). Rafe and one other in the new area. A Map of this huge area. The newly developed concrete pads. before they were grass. It really is a well set out place and HUGE. The new pads with new power boxes. 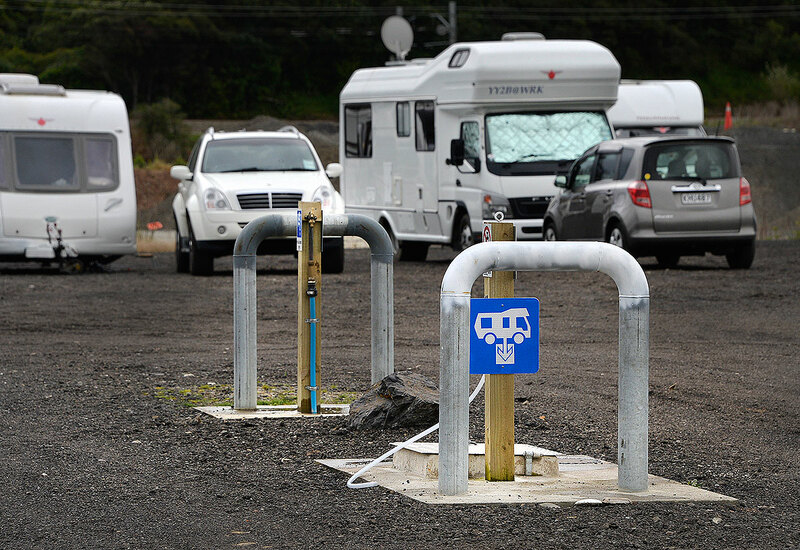 The Motorhome park I stayed on was one of ten new concrete pads with new power boxes and plenty of water taps and even grey water disposal every second or third site. Toilets and Showers were handy and and spotlessly clean. With the NZMCA discount, I was charged $16 a night in the offseason which I thought was very reasonable. I went for a walk around when I first arrived as the weather was due to deteriorate. I ended up right at the top of the Camground where there is a very robust set of concrete steps down to a small private beach called Jacobs Ladder. Apparently it is very popular for fishing off the rocks. Around further is access to the Red Beach Surf life saving area which the camp helped setup years ago. A neat sandy beach and safe for the littlies for swimming. I’ll be back, a great spot with friendly staff too. And down a short pathway, Red Beach looking stunning.